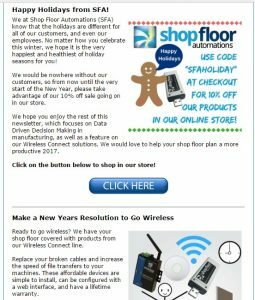 This is an archive of our December 2016 Shop Floor Automations newsletter. of holiday seasons for you! going on in our store. plan a more productive 2017.
from our Wireless Connect line. be configured with a web interface, and have a lifetime warranty. regardless of the machine’s age, with RS232 or Ethernet. adopt it into your manufacturing habits, too!